TORRANCE, CA -- LEDtronics® announces the latest additions to its series of energy-efficient replacements for PAR38 light bulbs. 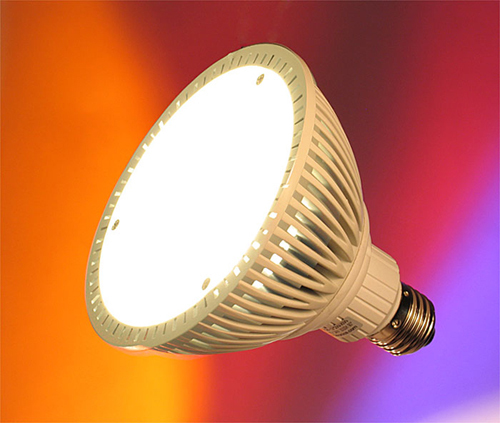 The high-power PAR38-12X2WF series of warm-white and pure-white frosted soft-flood bulbs offer long-lasting durability, low power consumption and money savings. They run a wide range of voltages from 85 to 265VAC requiring no special adapters, while consuming less than 18 watts. The bulbs directly replace halogens and metal halides up to 90 watts, providing 77%-85% energy savings. In addition, the series PAR38-12X2WF boasts an outstanding color quality, a wide-focused beam of around 90 degrees, powerful 661 (XIW) and 808 (XPW) lumens of brightness, easy drop-in installation in existing 26mm Edison/E27 European base sockets, and sturdy construction with UV-stabilized plastic lens and magnesium alloy housing. Because LEDs have no filament, their solid-state design renders them impervious to shock, vibration, frequent switching and environmental extremes. With an average lifespan of more than 50,000 hours (5.7-plus years), white LED bulbs operate more than 20 times longer than the equivalent incandescent bulb! Unlike compact fluorescents, LEDs contain no harmful mercury, and because they do not emit large amounts of heat, UV or infrared light, they protect what they are illuminating--everything from priceless art to fresh arugula. This makes them perfect for use in museums, hospitals, offices or areas where UV radiation might degrade the surroundings (such as illuminating valuable artwork, wine cellars or food counters). The fact that they run remarkably cool also means they greatly reduce the fire hazard normally associated with the use of incandescent lamps. Lighting designers and commercial institutions should sacrifice nothing in the pursuit of beautiful, energy-efficient light, and with the PAR38-12X2WF series, they won't need to compromise. These economical, high-quality floodlights are perfect in track lighting, security and emergency lights, general/architectural and landscape lighting, display case fixtures and cabinet lighting, signage and back lighting, aviation/aerospace lighting systems, industrial OEM equipment lighting, bio-medical and medical applications, museums or theatrical-effects lighting. The PAR38-12X2WF floodlights offer a directional light that is perfect for use in recessed lighting, accent lighting, garage or workshop lights, down lights and ceiling cans. These super-bright LED bulbs also are an excellent deterrent for intruders; you can depend on them to illuminate the perimeter of your house and enhance existing security measures. Since LED lights are 300% more efficient than compact fluorescent lamps, these bulbs are perfect operating on an alternative or renewable energy resource such as solar or wind power. The maintenance-free LEDtronics PAR38 series comes with CE safety assurance and is RoHS certified--it adheres to strict European guidelines concerning the Reduction of Hazardous Substances such as lead and mercury. Since it produces no harmful ultraviolet or infrared radiation, it reduces light pollution, and it is compatible with the international "Dark Skies" initiative. The LEDtronics PAR38-12X2WF-XIW-001W (warm white/3000K) and PAR38-12X2WF-XPW-001W (pure white/6000K) frosted LED bulbs retail for $145.60 each. Availability is stock to 4-6 weeks for special requirements. For additional information on how to incorporate incandescent-replacement, energy-saving LED frosted floodlights into your facility lighting plans or architectural designs, contact LEDtronics toll free at 1-800-579-4875, telephone 310-534-1505, fax at 310-534-1424, email us at webmaster@ledtronics.com or postal mail at LEDtronics, Inc., 23105 Kashiwa Court, Torrance, CA 90505.